For some people, forwarding emails is a troublesome task that they do daily. Most email clients—including Gmail—only allow you to forward one email at a time. So if you have a bunch of emails to be forwarded, you need to open each one and click the forward option individually just to complete this simple task. Wish there was a way to quickly forward multiple emails at once? Luckily, there is! 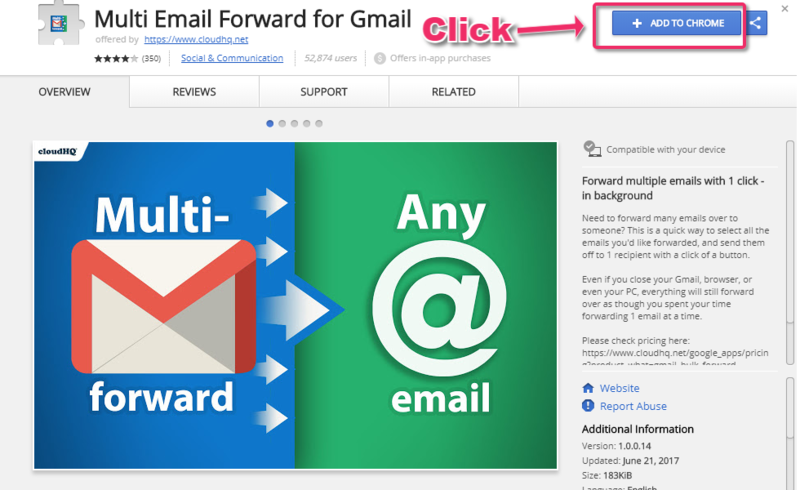 cloudHQ Multi Email Forward is an extension for the Chrome browser that lets you quickly forward multiple emails in your Gmail account. The forwarding is done 100% in the background and you don’t have to have your PC running at all. If you are looking to migrate your entire Gmail account, please check this support note which explains how to migrate emails using Multi Email Forward. If you want to forward emails individually, please read How to forward selected emails individually. If you want to forward selected emails in one mail, please read How to forward selected emails in one mail. If you want to forward selected emails in one mail as a PDF attachment, please read How to forward selected emails in one mail as a PDF attachment. If you want to forward emails in the label, please read How to forward emails in the label. If you want to migrate all emails to another Gmail account, please read How to migrate all mails. If you want to migrate all emails matching the current filter, please read How to migrate only emails matching current filter using Multi Email Forward. If you want to migrate emails in the label, please read How to migrate emails in the label.